25-Oct-2014 -- This is the first out of 2 reports reaching confluence points in Austria and Slovakia. Cycling and confluencing is my favourite combination of travel. To make it to a (to me new) confluence point and back to Zurich within a weekend, I usually get into area by train and start cycling from a train station. As I work for the Swiss Federal Railways, I am particularly interested in taking trains and researching the schedules. There is a convenient night-train from Zurich to Vienna. In summer I never managed to reserve a bicycle on the train, because the Danube River attracts cycling tourists from all over the world. Bicycle slots on the train are already booked out months ahead. But in autumn, when the cycling season is over, I can travel spontaneously, observing the weather map and adapting my destination to the best weather. I arrived at 8 AM in Vienna and had my breakfast in a particular ‘müsli’ restaurant. I planned to cycle along the Danube River to the confluence point, but soon I had to understand that this was impossible due to the current flooding of the river. Even the ferries had stopped their service such that I had to make quite some deviation via Hainburg. Finally, at 2 PM I reached the village Gattendorf which is 2 km north of the confluence point. The Road no. 10 misses the Confluence only by 200 m. I was able to walk to the exact location between two agricultural fields without damaging the crops. 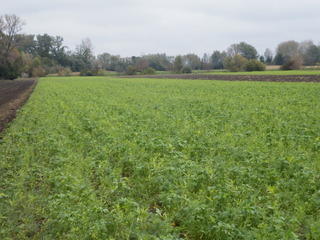 One field was ploughed and the other planted with carrot-like vegetables (since I didn’t dig one out, I can’t tell for sure). After the documentation I cycled further to Bratislava, which is less than 20 km away. The story continues at 48°N 18°E.